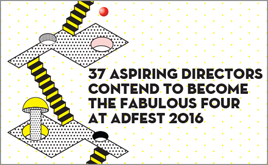 Thirty-seven aspiring directors from eight cities are competing to get a place in the AdFest 2016 ‘Fabulous Four’. Each year AdFest invites new directors to submit a short film inspired by the theme of the Festival. This year that is “Creative Intelligence”. Each year the festival runs this competition to encourage new talent. The directors must submit a script and four will be chosen to move forward with filming. The four chosen scripts are selected by Film Craft and New Director Jury, led this year by Jury President Sihabutr Xoomsai. The directors will only have a month to shoot and edit the films before the screening at AdFest 2016 held in Pattaya, Thailand, between 16th to 19th March.